Any specific reason you're connecting up your NESRGB to the USB Blaster? It's been over a year since the last firmware was released and I haven't heard anyone speak of any bugs with it. Just wondering to see if you were doing anything creative with the firmware like hacking your own palettes or something. Hoping someone can help out. I just received a complete RGB NeS from one of Tims recommended installers. I have it hooked up with one of retro console accessories csync shielded multi out scart cables. I seem to be getting an odd visual artifact. It's very subtle but noticeable. Best way I can describe it is that it's a few inch tall very light snowy appearance to the image that covers the full width of the screen. This fuzzy portion of the image scrolls from top to bottom on the screen and then starts back up at the top. It continues the entire time. Any ideas what could cause this? I'm using an original factory power cord and it is a front loader NES. I did this primarily because my two NESRGB firmwares were 1.3 and 1.5, respectively - I bought them in late 2013 and early 2014. The PCB design was just an 'ease-of-use' thing in case anyone was in the same situation as I. I actually have been messing around with some of the palettes, but nothing serious. I just wanted a board that I wouldn't have to rewire to attach my Blaster to. That could be a cheap or bad power adapter. If you are using a cheap third party one get another higher quality one or an official power supply. Ive seen this exact thing before and it was always a cheap or bad power supply. I tried a second power adapter (both OEM) and has the same issue. Like an idiot, I forgot to mention earlier that I'm using a Mad Catz SCART switch. I didn't think this was the problem as my Genesis is fine. But the cables for my SNES and NES just showed up together in the mail and turns out both have the same rolling band of light interference. If I hook them up straight to the HDMI converter it's crystal clear. So I don't derail the thread, could anyone point me in the right direction to resolve this? I've read a lot of threads recommending the Mad Catz switch to be best with no interference but my experience isn't the same. Any suggestions or ideas on what to search for? Thanks. SuperG's GSCARTSW is by far the best bang for your buck - reliable, clean audio and video, and a switch-enabled LM1881, not to mention a grand total of EIGHT inputs. This thing is a work of art, and, if I recall correctly, is only about $120. Really wish I saw this before I just spent $50 on getting a Mad Catz switch from the UK. I'd love to get that custom one you linked but it'll be a while before I consider get another one. I'd like to try to sort out what I have first. Maybe I'll see what I can get for the one I have on eBay or something. Don’t beat yourself for buying another switch for the time being. I’ve been on the waiting list for over a year and haven’t got it yet – I guess maybe 20 people or so have one. But yeah, it’s looking damn fine. I’m sure it’ll be worth the wait. Oooph just checked, can't even get on a waiting list for now. Possibly sometime 2016. So yea, if anyone's got a clue where to look for info to resolve the interference it would be greatly appreciated. And the NES RGB board is incredible. Wife even noticed, asked how the heck the games look so good! I have one of his 1st gen switches. It's solid. I bought mine secondhand from one of the other users on this forum. It really is a masterpiece. I had been using a 5-way Bandridge auto-switch before that I spent nearly $90 on to get imported, but SuperG has got a really solid device here. I didn't know they were so scarce, though. The NESRGBs are now back in stock in both the international and USA distributor sections. I know. I just bought one of each. 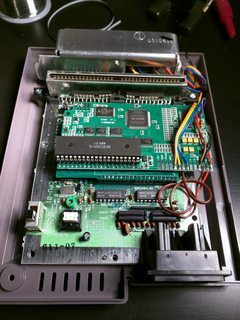 As already mentioned in another thread, I would like to equip my NES with an NESRGB board. Since I'm a soldering idiot I'm looking for someone in Germany who can do the mod. Until now I have only found a site named videogamesreanimate.de. Did anyone here let his NESRGB or any other mod do by the owner of this site and can tell me something about the quality of his work? Because I don't want to sacrifice my beloved old console to an amateur. Of course, any further recommendation is very welcome. Too bad price went up. Darn you USD!! I just spent $50 on getting a Mad Catz switch from the UK. Did you get the Mad Catz switch new from Amazon by any chance? I notice they suddenly have them in stock. I've been looking for another one for a while and nearly placed an order but noticed some recent bad reviews. In the pics they are also slightly differently coloured to mine which made me concerned that they weren't genuine. I know this doesn't help you with your issue but the old one I have here works perfectly with my RGB modded NES (and all other consoles) with no noticable degradation of image quality. In fact I've got it daisy chained through another switch (Silverscreen Trilogy) and still no issues. 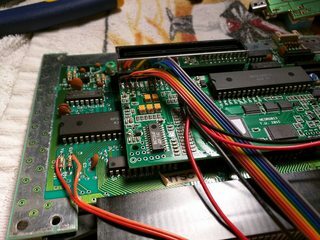 Hey guys, I'm about to finish the NES RGB installation on my AV Famicom, but I have few questions, can any one help me? The instructions on Tim's site shows how I can hook the R,G,B and composite video wires, but what about CSYNC and Svideo? Is already hooked? Video trace should be cut only if I want to use composite video from NES RGB board? Is there any difference between them? I already have a NTSC SCART cable for SNES, It is compatible with the NES RGB Board? What type of drill should I use to make the hole for the palette switch? 10mm is good? Last question, what is the best place to mount the video component 3.5mm/4P jack panel socket? You'll need to connect those since the AV Famicom never had either S-video or RGB. You don't need to connect the chroma and luma pins for S-video, but you may as well since you're working on the multiout anyway. Yes, and remember that the NESRGB needs to be shut off from the palette switch if you want to use the original composite video output. The NESRGB has 220 uF caps for the RGB outputs which are already inside the SCART cable, but you shouldn't encounter any issues. I'd recommend just getting a step bit, that way you don't have to constantly switch out bits as you're drilling. It's much faster and gives better results. Anywhere you prefer that isn't going to bump into anything inside, really. So, if I want wire up chroma, luma and csync pins, I should just follow this pinout http://gamesx.com/wiki/doku.php?id=av:nintendomultiav , right? Also, should I bother to use the audio from NES RGB board? So, anybody here has a photo from panel socket with the numbers uncovered? EDIT: I forgot to mention. both component and s-video uses the Y pin, can I hook both wires in the same pin or I have to choose one of then? Kinda messy but everything is working fine. Just finished adding expansion audio to my US toploader. This is my second successful NESRGB install and I couldn't be more impressed. There was some disagreement from various sources about what type of resistor to use for expansion audio on the toploader, so I ended up going with a 47k. I tried 100k originally, but the additional channels seemed very loud to me. For the outputs on toploader, I desoldered the RF out block from the mainboard and used the existing RF + switch spaces for the 8-pin and audio connectors. Thanks again Tim for the amazing board. These are a lot of fun to work with and the results are very much worth the effort. I went ahead and installed my NESRGB (will post pics later) using Helder's multi-out, wired for RGB, s-video, and composite. I try it on my pvm and get no picture..did a continuity check and everything was fine except for the 5v pad feeding the multi-out. Jumping it to the NES PPU 5v made it work. Is it ok to jump the 5V from the PPU to the NESRGB pad (next to the video pads)? Another question... which resistors should I tap the audio from (I know it's CPU pins 1&2), R4 and R5? edit: did a continuity test and found the right resistors to tap into, got audio working. Been using my SNES csync cable with my NES RGB for the past month with no issues. Wanted to order a second cable just for the NES so I don't have to keep switching. What's the difference between using CSYNC or composite as sync with the NES RGB? Is either superior? And advantages one way or another? The modded that did the work hooked up both to the board. So not sure which to choose. Thanks. If you got a cable that's working now, just get the same one and you'll be fine. I know the benefit of adding the expansion audio from the NESRGB for a frontloader, but is there any benefit for the AV Famicom systems, obviously they have expansion audio already but it it worth using the audio from the NESRGB itself?? Might be easier to equalize all the channels so one doesn't overpower the other? People say that the av famicom expansion audio is too loud. With the NES RGB audio and a resistor you can fix this, I think. However, I played Lagrange Point (original cartrige, EPROM replaced) a lot and never notice this issue. If you plan to play these games with an everdrive, don't waste your time, everdrive has an option to decrease the expansion audio volume.